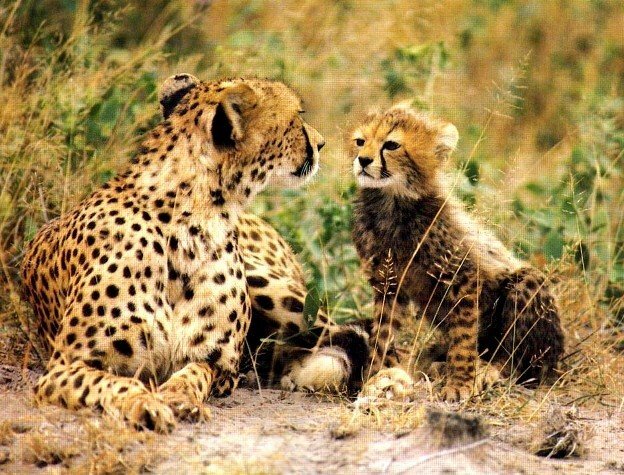 Cheetahs are my favorite of all the big cats. When I make my millions, I'm going to have my own cheetah preserve so I can see them all the time. They do not roar, but mostly communicate in high-pitched yips. Unlike most big cats, they do purr, especially mothers with their cubs. Also, unlike other big cats, the females are solitary, traveling with other females only when they have young offspring; males are sociable and form bonds with others for life (usually with littermates). They are endangered for a variety of reasons: Cheetahs find it hard to adapt to new habitats; they are difficult to breed in captivity; their offspring are extremely vulnerable to becoming prey to larger leopards and lions, as well as hyenas and even eagles (nearly 90% of cubs do not survive to be adults); they have very low genetic variability, to the degree that a skin graft can be made from any cheetah to any another without the body recognizing the graft as a "foreign" tissue. And their greatest strength - their amazing speed - can also be a weakness. After strenuous chases, they are nearly totally spent and need to rest before they can begin to eat, thus leaving their kill vulnerable to theft by scavenging lions and hyenas that the cheetah is too exhausted to drive off. There is a good video on cheetahs from the PBS "Nature" series called "Cheetahs In A Hot Spot," filmed in Namibia, home to the world's largest cheetah population. It's available for purchase at the PBS website.